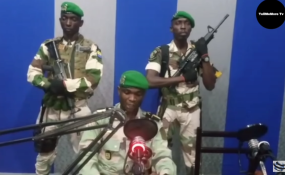 Soldiers stormed the national radio headquarters in Libreville, Gabon’s capital. Coups d'états have become increasingly rare across the world. When coups - or even attempted coups - happen, they attract a great deal of attention. This includes a growing number of data sources and analyses dedicated to understanding the historical patterns and consequences of coups over the last century. Further illustrating its stability, Gabon's GDP per capita is strong. Only the Seychelles, Equatorial Guinea, and Mauritius perform higher. Given the improbability of a coup in Gabon, and the failure of established economic and political predictors to anticipate it, we explore the reasons why the January 7 coup attempt happened. Furthermore, based on the analysis we've done on coups over the past 50 years, the fact that the Gabon coup attempt came as a surprise meant that it was much more likely to fail. Before January 7, 2019, Gabon had not experienced a coup attempt in over 50 years. The last attempt to overthrow the government happened in 1964 when political opponents within the military tried to unseat President Leon M'ba. While the plotters were initially successful, French President Charles de Gaulle quickly ordered a military intervention to restore the M'ba government. Motivated by oil interests and justified by a defence pact between the two countries, French paratroopers joined loyal Gabonese military officers and toppled the provisional regime within two days. Supported by the French, the M'ba government contained the coup plotters and put systems in place to minimise future coup attempts. Gabon soon became one of the most stable and economically successful nations in post-colonial Africa. President Ali Bongo - while considered to be an authoritarian - has maintained internal stability and economic growth. That's why predictions suggested a coup wasn't likely in Gabon. Looking at the country from the outside, the coup plot would certainly seem bizarre. But digging deeper, there were clues that it was on the cards. For one, President Bongo fell ill in October last year while attending an international forum in Saudi Arabia. Details about his condition were kept secret and the president didn't return to Gabon as scheduled. In fact, Gabonese coup leader Lieutenant Kelly Ondo Obiang cited the leadership vacuum as justification for the coup plot following Bongo's poorly received New Year's Eve address where he appeared frail and unstable. In the eyes of Obiang, the president was no longer capable of carrying out his duty to protect the Gabonese democracy and to ensure political stability. Like the plot against M'ba, the plot against Bongo failed quickly. Obiang's revolution didn't muster wider military support; nor did it incite a popular uprising. While the plotters may have cultivated a strong internal narrative to justify a coup plot, they didn't factor in the realistic odds of success given Gabon's political and economic environment. Compared to all African coup plots since 1950, Gabon's latest experience deviates from the typical successful coup. Looking at the relative risk preceding each of the world's coup events since 1950, we find that Gabon's percentile risk (72th) was nearly 23 points lower than the median risk percentile (95th) for all African coup events in the data. This suggests the conditions present in Gabon were far less conducive to a coup than the vast majority of previous attempts. So why would the plotters take such a risky action? On the one hand, Naunihal Singh, Assistant Professor at the Naval War College and author of "Seizing Power: The Strategic Logic of Military Coups", notes that risky moves can become successful if the conspirators can send credible signs to potential supporters that a coup will succeed. This would have been difficult for Obiang given his conspirators' relative anonymity and low rank. Singh recently stated that the plotters likely weakened their own credibility by admitting they had limited support when they asked the military and populace to rally behind their efforts. Instead of sending a signal of power, they acknowledged their weakness.